Health and fitness are the future for wearables, and no one knows it better than Apple. To that end, the iPhone 7 maker is reportedly working to take data collected from the Apple Watch 2 and use it to offer advice to users. Anonymous sources speaking to Bloomberg say Apple is ready to make its HealthKit and ResearchKit software solutions more powerful than ever. Currently, the Apple Watch is a good tool for monitoring your health data, like steps, heart rate and calories burned, but it doesn't interpret that data. Apple's ultimate goal is to turn HealthKit into a platform that provides advice and diagnosis for its wearers. According to Bloomberg's sources, the data collected from the Apple Watch would be interoperable, allowing it to be transferred between hospitals and databases for analysis. The ultimate goal is to allow physicians quick access to patient data to make diagnoses. The move towards making the Apple Watch a health care device makes complete sense. The global health care market is a $8 trillion opportunity for Apple, according to Bloomberg. By diversifying into health care services, Apple could aid its slumping iPhone sales with another revenue source. The majority of Apple's income stems from its hardware sales, which are slowing. Apple has diversified by offering cloud storage with iCloud and music streaming with Apple Music. With HealthKit, Apple could build a platform for health that would lock users into using its devices, like the Apple Watch and iPhone. The biggest thing holding Apple back at this point is that the Apple Watch 2 still requires an iPhone to work. 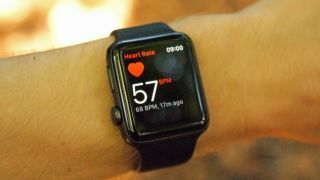 Until Apple can make a Watch that can connect to the internet without an iPhone, it'll be impossible for Apple to provide real-time health data analysis from the watch itself. Apple needs to tread carefully though, as being responsible for patient data is literally a life or death situation. If the data being collected from the Apple Watch is incorrect, then so are the diagnoses made with that data. The future of wearable data analysis may be many years away, but it's a future worth looking into.